The red pepper and the asparagus in this pasta primavera recipe go together great for a crispy, tasty “Pasta of the Spring” (that’s what primavera means). 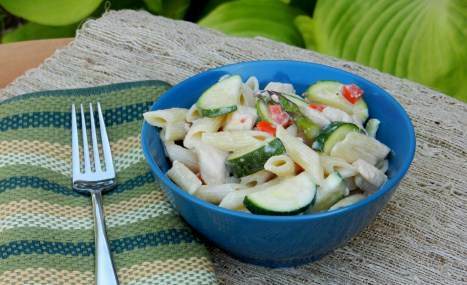 Pasta Primavera is also very flexible; you can add any type of vegetable you like. To stay classic, crisp, fresh vegetables will give you the best results for this delicious recipe. 1. Cook pasta as directed on package. 2. Meanwhile, heat dressing in large skillet on medium heat. 3. Add chicken and vegetables; cook 10 to 12 min. or until chicken is cooked through, stirring frequently. 4. Add broth and cream cheese; cook 1 min. or until cheese is melted, stirring constantly. 5. 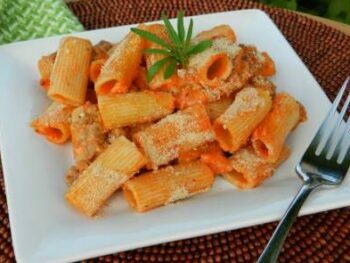 Add Parmesan cheese; mix well. 6. Drain pasta; return to pot. Add chicken and vegetable mixture; toss lightly.